**Originally posted on my site BUNNYCATES.COM **My Thoughts: I was sent a copy of this book from the author. She, like us, is from Kentucky so I couldn’t wait for it to show up! I think I was more excited about it coming then Sis was! Can I just take a moment to comment on the cover art. GORGEOUS! Sis (age 10) and I read this one as a “read together” book. Each night, each of us would read a chapter aloud. I really enjoyed it. It was great mommy/daughter time, and the story was fun and different. From a mom’s perspective, I thought the book was great. 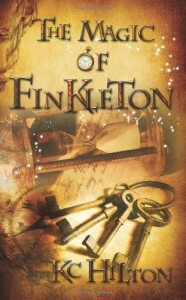 I kept thinking The Magic of Finkleton would be an easy way to introduce the topic of a death (which is really a hard topic to introduce to younger ones). In the very beginning Uncle Harry passes away, and the family have to move to take over his store. The story touches on their loss of the Uncle, and throughout the book the continually talk in remembrance of him. I know I am “reading” a lot into it, but I thought that having them talk about Uncle Harry, etc. Shows younger kids, that may well have not had to deal with “death” yet, that it’s ok. People die, that happens. It’s ok to miss them, and ok to go on remembering them. I just thought it was a wonderful piece of the story.The mysteries kept me (the adult) reading and entertained. I couldn’t wait to find out “what” was going on. =D I enjoyed the kids mouthiness, and then how their secrets bind them as they try to solve the mysteries! Sis and I literally laughed out loud at the kids bantering back and forth at each other. “She’s not a LADY”… LOLMy favorite character in this book has to be lil Lizzy and her love for books. She has a smart mouth and a love for words. That child could definitely have been born to this house. LOLIn the end, I say this is a great book. Would be great for kids say 6+ (with help reading). I enjoyed this one, and Sis’s review of it will be up later this week if you’d like to see her take on the story.